Just because Google hasn't officially announced the HP Chromebook 11 4G LTE release date doesn't mean the cellular-capable laptop hasn't stealthy launched, according to Best Buy. 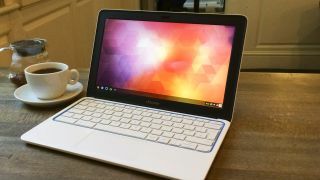 The retailer confirmed to TechRadar that the 11.6-inch Chrome OS laptop is on its shelves in select stores (not online), and takes advantage of US carrier Verizon's LTE network when Wi-Fi is out of range. That comes at a price. The HP Chromebook 11 with 4G LTE costs $379 (about £289, AU$476), which is significantly more than the Wi-Fi-only model's price of $279 (£229, AU$364). Outside of the LTE chip, it has the same specs. An LED-backlit 1366 x 768 resolution display, a Samsung Exynos 5250 ARM processor, 2GB of RAM and 16GB SSD internal storage. Even though the HP Chromebook 11 with 4G LTE is more expensive than its Wi-Fi counterpart, it's still the cheapest Chrome OS laptop with an LTE chipset. All other low-cost Chromebooks are either Wi-Fi-only or 3G-enabled, whether you're looking at the Acer C7, the Samsung Chromebook or the forthcoming Toshiba Chromebook. Google's own Chromebook Pixel does feature a LTE among its high-end specs, but it also costs $1,449 (about £886, AU$1,627). That's certainly not on the low-end by any means. The HP Chromebook 11 with 4G LTE is the only affordable Chromebook with a speedy LTE chip in town - or at least at Best Buy. But not for long. Calls to Best Buy stores with availability indicated a limited supply, with many managers reporting as few as three left. Read: Google's new Chrome app can cut data in half on iOS, Android.